Thursday, we had Ms. C. from the Wildlife Experience program. She will be visiting us five times before school is out and will share animals from North America. This is a complement to our science unit on Animal Adaptations. We learned that a fly has a compound eye. That means it sees many of the same images at one time. 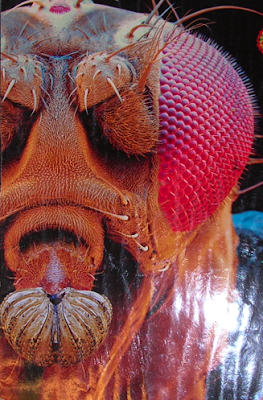 Above is a picture of a fly's compound eye. They are difficult to swat because they really see you coming. 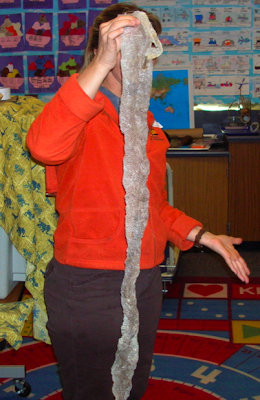 She told us that snakes are reptiles, and that they shed their skin as they grow. Here is the turkey vulture, the only bird in North America that can smell. It can smell something two miles away. It eats dead things off the ground. If you look closely at its right wing, you will notice it is deformed. He was injured when he got hit by a car. Luckily, someone called the Wildlife Experience group and they saved him. Its predators are bobcats and red tailed hawks. Because he had a hurt wing, he could not fly away and a predator could have killed him and eaten him. The salamander is an amphibian that has holes on its body so it can breathe in water and on land. Interestingly enough, the salamander had tiger strips that were yellow and black. These beautiful stripes give it the name the tiger salamander. 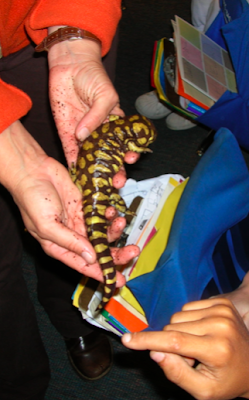 The tiger salamander had a long, lizard-like tail that the class got to stroke. 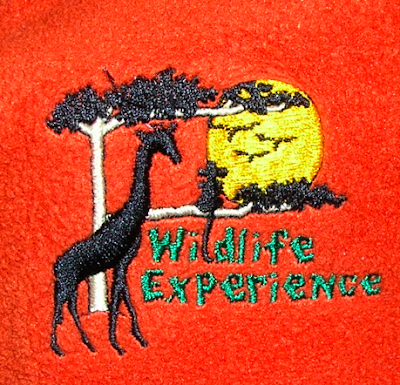 The Wildlife Experience was fun and great for learning about animals from North America. Have you ever seen these animals in the wild? Do you know anything else about turkey vultures or salamanders? I loved petting the salamander! Amazingly, I had the courage to pet him. I hope that we get to see more animals in the same family as the salamander. I thought the assembly was so illuminating. The turkey vulture was very amazing. I loved how every now and again he would show us his wings. I wonder what the wingspan measurement would be. How about you? We thought that real animals came to our class was a treat! It was fun to touch the Salamander, but alas the Turkey Vulture's wing was hurt. We thought that Ms.C was a pleasure in our class! I can't believe that the turkey vulture deficated on our carpet. Yuck :O ! I liked the salamander better because it had dolphin-like skin. I loved seeing the animals. I thought it was interesting to see the salamander and the turkey vulture. I thought they were interesting because the turkey vulture was huge and the salamander was slimy. Alas, it was time to see them go back to captivity. The assembly was spectacular! I liked the salamander best because of it's soft skin and beautiful unique markings on it's skin. I'm looking forward to learning about other animals at the next assembly. Wow! Another awesome blog post from Mrs. Yollis' class. 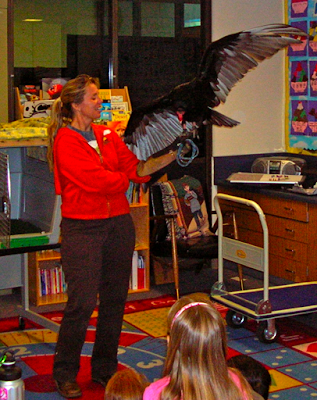 You were very lucky to have a real Turkey Vulture in your class. Also, that was one gigantic salamander! We have lots of salamanders here, but I don't think they get that big. Our class studied adaptations in the fall. If you click on my name above, it will take you to a video podcast we made from one of our adaptation field trips last year. We have another adaptation field trip next Friday. I look forward to your next learning adventure! I love that the Ms. C will bring new animals every week! It is very fun touching everything! What do you think she will bring next time? I went to your site and watched and listened to your adaptation podcast. It is great! I will show it to my students tomorrow. It's cool how you told us about the turkey vulture and the tiger salamader. The colors on the salamander are awesome and I think that it's gross that the vulture eats other dead animals.